Any one want to get the on farm practical knowledge of Guar Cultivation can contact us. We will take you on tour for guar cultivation. 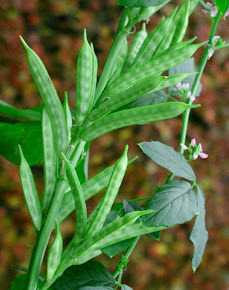 Guar as emerged as one of the major industrial crop. The crop has given very good return to the farmers of Western Rajasthan, (Totally Rain-fed and dry Area). This also a useful crop in many other ways like improvement in soil fertility, low cost of cultivation, Cattle feed, on the request of the growers we are organizing the tour of the Guar Crop Exposure. We are organizing two-three days tour program. Other important aspect of guar crop in the field. This year guar seed ( guar gum ) cultivation area has increased in India. This is mansoon time and temperature is going down toward the normal temperature. Difference between day and night temperature is very low. Sunshine hour are very low due to cloudy climate. These type of conditions are favorable for the disease attack . Role of plant protection from disease and pest attack is very important at this stage of crop in guar seed ( guar gum ) cultivation . Farmer must go for regular spray of bactericide like Streptocycline @ 5 gm / 100 Liter water or Plantomycine @ 50gm /100 Litre or Agromycine @ 30 gm /100 Litre . The root and stem will start rotting. Farmer should go for application of Zineb / Mencozeb-0.2% 2gm / Liter or any other available fungicide. 3. Seed treatment with Agrosan GN or Thiram or Capta. The Gavar / Guar / Guwar / Guvar bean or cluster bean (Cyamopsis tetragonoloba) is an annual legume. Guar beans have a large endosperm that contains galactomannan gum, a substance that forms a gel in water. Initially low rainfall and drought condition in this Kharif ( Rainy Season ) crop worked as a reagent in increase of Guar seed ( guar gum ) cultivation area. This is called GUARTEK EFFECT in economics. What is GUARTEK EFFECT effect ?? ---> In extreme and adverse condition, economic behavior of human activity leads to natural economic practices. Its implication in " Increase of guar culitvation Area in Rajasthan in Kharif ( Rainy Season ) Crop. Every one was in tension due to El-nino effect ( expectation of poor rainfall ). There were clear probability of complete drought year in guar growing belt of Rajasthan, Haryan, Punjab and Gujarat. Initial rainfall was under 80- 90 % deficient condition in this region. Farmer were waiting for good and regular rainfall to start sowing. This year Manson arrival and activation was very late. These condition leaded to increase in Guar seed ( Guar Gum ) cultivation area. In these condition farmer adopted guar as a drought resistant crop, which was a natural crop of this area since centuries. It is a true example of GUARTEK EFFECT. There are following two major reason behind this Increase. Reason 1 :- Replacement of high water requirement crop cultivation area by Guar seed ( guar gum ) crop cultivation area in irrigated area. In irrigated area farmer were not sure if they will able to get the regular supply of the irrigation water during this cropping period from Canal or tube-well, because if it would have drought year then there would not have proper recharge of ground water and irrigation project dam. There were chances that high water requirement crop can die in between. Farmer was not suer about the economic return from high these crop. he wanted to keep his cost of cultivation under control. Guar was a best alternate for him, he adopted it. Reason 2 :- Replacement of other crop cultivation area by Guar seed ( guar gum ) crop cultivation area in rain fed area. In drought area, farmers don't have too much options, generally farmer go for Bajara, Mung, Moth and Guar seed ( guar gum ). In these crop, Guar seed ( guar gum ) is only cash crop. farmer were not sure about the good rainfall so was not sure about good production. The rate of Guar seed ( guar gum ) was stable during last two three year , which is double, triple, four time to other commodity price. 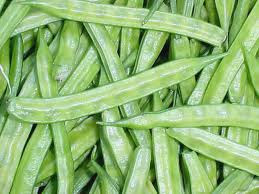 Guar seed ( guar gum ) has industrial application so farmers were sure about demand of Guar seed ( guar gum ) crop, that it will increase if there were any adverse condition. other rest three crop have alternate like Bajara is used as food crop, it can be replaced by any other food crop. rest two crop are pulse, which can be replaced by any other pulses. Guar don't have any alternate , so farmer shifted toward Guar. In the late activation of Manson farmer started sowing with Guar in rain fed area to keep himself at safer side. Guar is also as good source of green Vegetable for human and fodder for cattle . 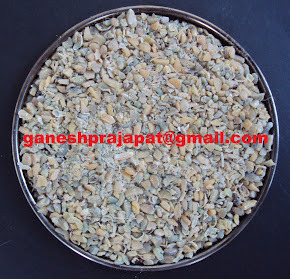 Rajasthan contribute around 70% - 80 % of total guar production and Guar seed ( guar gum ) cultivation of India. The safe type of activity is also adopted in the guar growing belt of Punjab, Haryana and Gujarat. We expect increase in total Guar seed ( guar gum ) cultivation area throughout the India. small contribution can be from Maharashtra, Andhra, Telangana and M.P. Later rainfall is continue and good so we expect that guar crop will be good. If the climatic condition will be in favor , than there are chances that, in this year total production of Guar seed ( guar gum ) can cross last year production. Last year it was a record production of 2,80,00,000 - 3,00,00,000 bags of Guar seed. This year it will cross last year production specially in Rajasthan. There is no doubt in Normal guar seed production. An expected bracket of normal crop is 18,00,000 MT - 24.00.000 MT Guar seed production..
As per data released by Govt of Rajasthan it has found that the Guar seed ( guar gum ) cultivation area has increased in comparison to sowing of of last year till date. Initial statics show that this year total area under guar cultivation till 7th August, 2014, is 2.75 Million ( 27.5 Lac) Hectare. 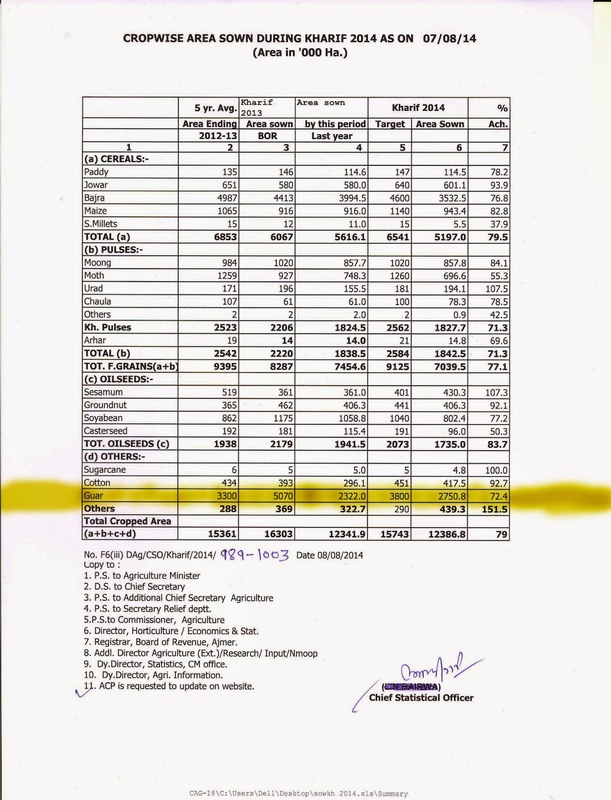 During last year Guar seed ( guar gum ) cultivation was only 2.32 Million ( 23.2 Lac ) Hactare. It is sharp increase of around 19 % . It is also observed that same trend keeps going. In same trend it is expected that it will cross Total showing of last year which was 5 Million ( 50 Lac) Hectare. This year guar sowing/ Guar seed ( guar gum ) cultivation area will be at record level. This year we can expect a bumper production, because the late rainfall is sufficient for better crop. There can be some effect on early crops but after the rainfall crop is standing in good condition. Might be total production can be lesser than last year but this year production will be much higher than last 5 year Average. In the Global market crude oil price are at the lower level . On 4th august it was at six month low. This price will effect the global energy price and that push will further put pressure on guar gum prices. The price fall doesn't give any sign of new investment in the Oil and Natural Gas Industry. Half of current financial has been passed , for the remaining financial year this is last time for new guar gum demand. Currently I am monitoring and analyzing that Guar rate are slowly going up. Investors are advised to keep away from market this type of abnormal behavior. as i have discussed earlier that there is no problem on supply side fro guar seed. There are chances that speculators have again active in the market otherwise I am not seeing any reason in increase in demand of guar gum and further price rise in this commodity, be cautious. The global demand in oil and natural gas industry can lead toward increase in guar and guar gum prices. In another analysis it has found that oil and natural gas drilling / fracking companies has stoked guar gum for one year so that they can avoid themselves from unnecessary price fluctuation. There can be minor effect due to USD / INR exchange rate, but the current exchange rate change is not sufficient to effect it. The existing contract will keep going there is low chances of new contracts in market. Sanctions on Russia will also keep pressure on Russia to lower the prices of Natural Gas. Low natural gas prices will keep pressure on International Energy prices. This effect will further transmitted to guar gum and guar seed prices. It was expected that fracking activities was suppose to increase in Russia , but the technology is laying with American Companies and sanctions will keep them away from Russia. A huge quantity was suppose to be used in Russian oil field by american companies. Now there is no chances of further progress in this issue in coming next 12-18 months. Guar seed and guar gum prices will be under pressure due to these sanctions on Russia. The carry forward stock of guar seed is major aspect to decide guar seed and guar gum price. Farmers and traders are still having huge stock of guar seed. Last year price stability and decline was due to carry forward of huge guar stock of 2012. As an rough calculation there is 5,00,000 MT guar seed stock of 2013 and 5,00,000 MT guar seed stock of 2012, 5,00,000 MT guar seed stock of 2011 and before that. So total tally of carry forward guar seed stock is around. 15,00,000 MT. The available stock of guar seed for year 2014-15 will be around 30,00,000 MT. The estimated consumption of guar seed in (Year 2014-15) can be in between 22,00,000 MT - 25,00,000 MT. More or less 5,00,000 MT - to 8,00,000 MT buffer Guar seed stock will keep pressure on guar prices in year 2014 - 2015. If price of guar seed go below the bracket of 3500-4000, then there is chances of increase in consumption. In that case price consumption can cross the limit of 25,00,000 MT guar gum seed in year 2014-2015. But it is only possible if price of guar seed go below INR 3500/ 100 Kg. Till this consumption there will be pressure of carry forward Guar Seed Stock. Recovery in Monsoon will lead to a normal guar seed crop in year 2014-2015 as per current climatic condition. Rain fall is good in Guar growing belt. Early sown crop will be befit from it and will recover from drought condition. New crop will start to come in market after mid of October. Delay in monsoon has increased Guar sowing in irrigated area. Irrigated area work as a insurance of good production for Guar Crop. At other side late rainfall increased the late sowing in rainfed area of Chrur, Hanumangarh, Ganganagar, Bikaner, Jodhpur, Nagor and Jaisalmer. Initial delay in monsoon weakened the guar seed crop production.but it improved significantly. Shadow of poor monsoon will effect the production of guar seed but it will not effect the business of guar seed and guar gum. If monsoon keeps going as it is right now , then it is expected that in this year 2014-2015 , there will be production of 18,00,000 MT (18 Millions Bags of 100 Kg. each) ) of Guar seed. Though this production is not sufficient to cover the expected total demand of year 2014-2015 but carry forward stock of last year will make it surplus amount to fall in the price of guar seed and guar gum in year remaining period of year 2014-2015 . Winter time will start after two months. In the winter month the new fracking activities will come down. because oil and gas company will start to work on production of Gas as the energy requirement will be increased in most of developed countries. Halt is fracking activity will not lead to any major new contract or demand of guar gum . Existing contract of guar will keep going. Mostly frackign activity is completed during the summer period. Low frackign activity will keep pressure during the remaining period of 2014-2015 up to march. In the next 6-8 months the demand of guar guar seed and guar gum will come down. Last month it was seen decline in price of guar seed and guar gum. Condition will be remain under pressure up to next six months. The use of guar gum and its derivatives will come down in next six months. The improvement in the mansoon is major factor to keep the prices under control up to next 6-8 months. Fear of poor monsoon has gone away from the mood of farmer, trader and the processor. The improved Monsoon will support farmer as it will keep his farm expenses lower. The arrival of other commodities will also increase the business of trader and processor, The profit from other commodities will keep liquidity in the market and there will be money in the hand of farmer, So there will be no major pressure of liquidity on single Guar seed commodity o. In this improved monsoon condition it is expected that prices of Guar seed will be remain under pressure. Guar seed prices can come in the bracket of 3500-4500 in year 2014 - 2015.